A glittery, super-famous movie star in its own right: The Santa Monica Pier, one of the listings in "Hollywood: The Movie Lover's Guide"
We're lucky to live here, for many reasons. #93? There's a new local-focused guidebook out on Los Angeles every three days, or so it seems. While they are all pretty excellent -- seriously, we could linger at the local table of any bookstore for hours -- we consistently recommend these three to people shopping for LA aficionados. "Walking LA" by Erin Mahoney: A new-ish, pink-covered version is out with some added walks (36 in all), including South Pasadena. Our older book (the blue cover) is well worn. On our last stroll, we emerged from a secluded area to see a guy who, spying the book in our hand, said, "my favorite, I love it!" A bonding moment. And a really fine book. Best walk so far: By the Ennis Brown house, in Los Feliz. "Wilshire Boulevard: The Grand Concourse of Los Angeles" by Eric Lynxwiler: He provides commentary on the Museum of Neon Art tours; he also really knows Wilshire. We had no idea the Ralph's near the Tar Pits has such a fancy-dancy facade back in the day. And Bullock's? Can we live there? "Hollywood: The Movie Lover's Guide" by Richard Alleman: Famous buildings/streets/locales from big films. Like the Alto-Nido apartments, which are so "Sunset Boulevard" to us. And the "Alias" apartments. 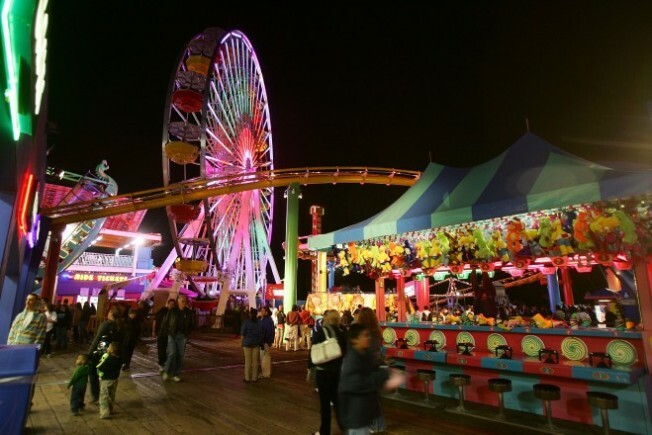 And everything cinematic that went down at Santa Monica Pier. Golden stuff. There are many more to love, and many to own. What are we missing? Any guides -- save the Thomas Guide, natch -- that Angelenos must own?